You can trust TA Truck Service to help keep your trucks rolling safely. They have more than 2,500 ASE Certified Technicians ready to help get your truck back on the road in no time. And we'll help you save up to $15 every time! Check your profile to make sure we have your correct DOT number listed on file. Stop at a TA Truck Service location and purchase any approved PM or DOT services. Get ready to smile. The discount will automatically appear on your invoice, based on your DOT number. 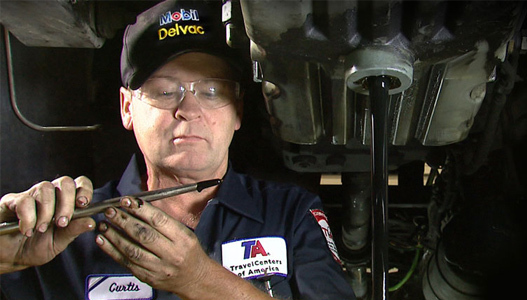 TA Truck Service offers the most comprehensive preventive maintenance service on the highway. We offer top savings! While you're here, don't forget you can also fill up on fuel savings of a minimum of $.10 per gallon. Get a $15 discount on TA Truck Service breakdowns. The Important Stuff: In order to ensure that you receive the discount, we must have your DOT number on file. Please review and verify that we have the correct information on your account. If you do not see the discount on your invoice, please call us at 888.937.6334. TruckersB2B savings cannot be combined with any other discount program. Not available to customers that already receive PM rebates directly from TA or Petro.